5 tips for spotting super supermarket deals! Money saving / 5 tips for spotting super supermarket deals! Supermarket deals are great, aren’t they? Well, some are and some aren’t, learn the difference with our blog. Grabbing a bargain can make your day – there’s nothing better than getting something you want at a knock-down price. But, is that special offer really that special? How would you know? Could you work out the math to make sure you’re not being ripped off? If you don’t, you could be in for a shock when you arrive at the tills. 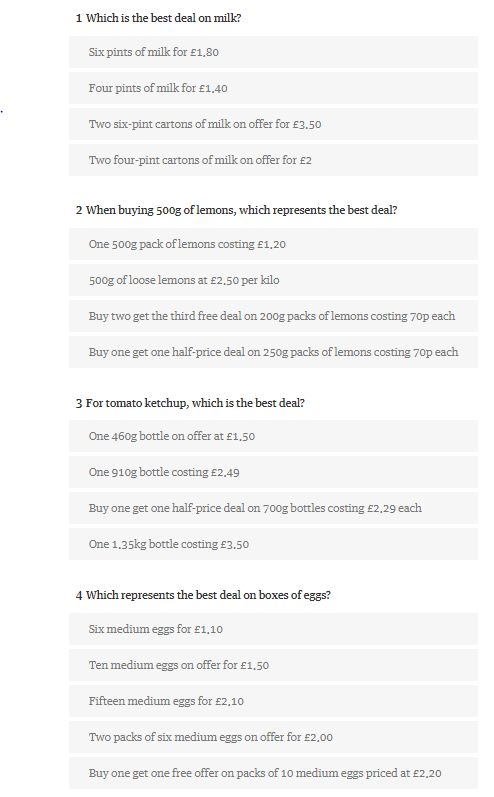 With supermarket deals in the headlines again, we thought we’d have a look at how to decide which deal is a true bargain, and which just look like bargains. After all, according to the article, British shoppers are actually spending more while trying to work out where the great bargains are. And not just a little bit more, a lot more – over £1,274 more according to the article. This seems like a silly situation to us at DAC – people end up spending more, while trying to spend less. So what’s going on? The answers are at the bottom of this blog. How did you do? Did you do better or worse than you thought you would? Were you at all surprised by how hard you had to work to discover which of the deals represented the best value for money? Now imagine doing that in the supermarket, while you’re trying to manoeuvre two kids away from the sweetie aisle and dodge your way around other trolleys to get to the tills and out of the shop before your parking ticket expires. You can see how it might be tricky to keep track of which special offers are actually that - special! We also bet that some of the confusion has come from the fact that most people assume that the supermarket is automatically going to give them the best deal. That may have been true at one time, but sadly not anymore. So, what can you do to protect yourself from being caught out and spending too much? Well, the first thing you can do is try out your current knowledge on deals. Here are five tips for spotting whether that bargain is really a bargain or not. It’s really not that hard, you just need to check, check and check again! This is one of the biggest indicators of whether that offer really is as much of a bargain as it seems. Why is this important? Well it shows you what you are paying for 1 unit of the item, whether that’s a millilitre or gram. So, while a 100ml bottle of pop is almost certainly going to be less in price than a 200ml bottle, the cost per 1 unit of the item will be cheaper. So comparing the unit prices does allow you to decipher whether what you’re buying really is cheaper than the other variations of the product, different sizes or multipacks, and how it compares on price to other similar products by different manufacturers. Now you have this figure, you can compare the prices of differently sized packs and alternative products easily and quickly. Often people are caught out when they get to the till because what they’ve picked up is not one of the products that’s on offer. This can happen when you’ve got a range of items, with some included in an offer and some not. For example, three cheeses for £3 – you might have two cheeses from the range and one that isn’t. Now, when you get to the till, are you going to be bothered going back and changing the cheese that’s not in the offer for one that is? Probably not if you’re honest with yourself. Of you’re not sure of your ability to keep track of all your special offers as you trawl the isles, make a note of them. Mobile phones are a great way to do this. You can either note down the offers on a notepad style app on your phone or just snap a picture of the offer ticket, so if there’s any confusion when you come to pay, you can check the offer quickly and easily without having to leave the till. Don’t forget to check the price of the smaller pack sizes. This is because, in the past, the logic has always been, the bigger the pack size, the less money it costs you to buy. Nowadays this logic doesn’t apply anymore. There have been times where people have discovered that smaller pack sizes have worked out cheaper per unit. So always check. When you have reduced items, we’d always advise that you check the prices are reduced as they are put through the till. However, special offers don’t always appear until the end when get your receipt, take a couple of minutes to check the offers you’ve received. Thankfully, these days the offers are usually highlighted for you when you get to the end of the receipt. And, if you’ve made a note of the offers you took as you were walking around the shop, this should be an easy task. Just match up the offers you believe you’ve bought with what’s on your receipt and bob’s your Uncle. If you see anything that’s not gone through as an offer, and you think it should have, get yourself off to the customer service desk and ask them to check it for you. And you may find that the error made at the till could prove to be profitable as some supermarkets, like Tesco, have a double the difference policy. This means that if you find an error on pricing, you’ll be given back double the amount of the overcharge. So for example, if you bought a pizza for £2.00 and you were charged £4.00 at the till, that’s a £2.00 overcharge, which is doubled-up to mean you end up with £4.00 in your pocket. Or you look at it another way, that’s a free pizza dinner, which is always a winner! So, now you’re armed with these tricks, you shouldn’t be caught out by confusing supermarket deals anymore.